The Jump 2015: Joey Essex wins the competition after a 17.5 metre jump! Joey Essex has won Channel 4’s ‘The Jump’ 2015 after ski jumping to an impressive 17.5m beating the rest of the finalists to 1st place. Tonight on The Jump, the competition was fierce from start to finish as the remaining six competitors battled it out to be crowned Jump Champion 2015 and take home the coveted Cowbell Trophy. Ultimately no one could out jump Joey Essex who flew to victory with a 17.5m ski jump. The six finalists battled it out in three gruelling winter sports – Ski Cross, The Air Jump and The Ski Jump. How hard could it be..? Up first in Ski Cross it was mighty Mike Tindall, Essex’s finest Joey Essex and Chelsea’s head girl Louise Thompson. Mike was taking no prisoners, Louise T and Joey both put up a good fight at the start with the Chelsea girl taking the Essex boy out and Joey couldn’t get his skies back on. Louise T was hot on Mike’s heals but she couldn’t quite catch the ex-rugby player and Mike’s win meant they both had to head back to the top of the course to race again. Next to race were Paralympian Jon-Allan Butterworth, fitness expert Chloe Madeley and Olympian Louise Hazel. Jon-Allan and Louise H both had their eyes on the prize and it was a tough race down the course, but Louise T dominated after a strong stat from all three, leaving Jon-Allan and Chloe to race once more. Louise T, Joey, Jon-Allan and Chloe then prepared to race for the final time to secure their place in the final Ski Jump of the series. The pocket rocket Louise T was in it to win it and there was no chance Joey, Jon-Allan or Chloe would catch her. For the three slowest racers The Air Jump loomed and with only one more place in the final Ski Jump the pressure was mounting to give it all they could and launch themselves into the air. Jon-Allan was up first on The Air Jump and his competitive side showed no signs of waning as he leaped to 6.30m. Chloe was up next and she knew she had to jump higher than Jon-Allan to stay in the competition. She reached 6.73m knocking Jon-Allan out of the competition. Finally it was Joey and it was clear that the man who’d so far avoided the Ski Jump and Air Jump looked determined and reached an impressive height of 6.91m, denying Chloe a place in the final Ski Jump of the series. It was the down to The Jump and who could land the biggest distance. Mike was up first and took on the middle jump (K24) jumping 16.5m, followed by Louise H, also off the middle jump, reached 16.5m, tying the two professional sports people remaining in the competition. Louise T flew 15m and finally Joey ski jumped live for the first time and hit the 15.5m mark. Meaning with the shortest jump Louise T was out and the final three had to jump once more for the title. As the final three – Louise Hazel, Joey Essex and Mike Tindall – headed back to the top of the jump for the final time. Louise H was up first and chose the biggest (K40) jump knowing this was her last shot to prove she deserved to lift the Cowbell trophy, she had a strong jump and landed 17m. Joey was up next with only his second live jump of the series, he wasn’t brave enough to take on the biggest jump but managed to leap and impressive 17.5m from the middle (K24) jump. Mike was up next with the final jump of the series, he’d jumped 18m in episode one, but would he be able to match the series record? Going off the middle jump, he looked confident but it wasn’t enough as he landed 17m meaning Joey Essex was crowned Jump Champion 2015. 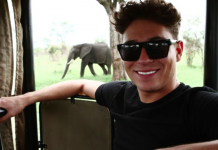 Joey Essex to host I’m A Celebrity… Get Me Out Of Here Now!? 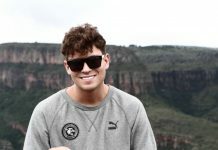 ‘Educating Joey Essex’ is returning for a second series, says Joey! 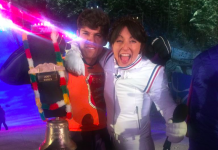 The Jump 2015: Almost 2 million people watched Joey Essex win the show! 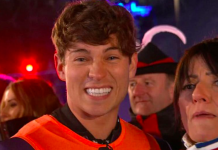 Watch the moment Joey Essex wins The Jump 2015! The Jump 2015: JLS star, JB Gill eliminated in the semi-finals! The Jump 2015: Steve-O eliminated and Mike Tindall gets pass to the final! 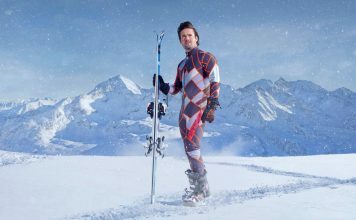 Spencer Matthews wins The Jump 2017! Spencer Matthews in agony as he dislocates his shoulder in crash on The Jump! The Jump 2017: Robbie Fowler eliminated after failing to land The Jump! The Jump 2017: Mark Dolan is the second celebrity to be eliminated! Davina McCall admits she’d never ever do The Jump! The Jump 2017: Josie Gibson REFUSES to jump and is first to be eliminated! The Jump 2017: Vogue Williams wants to return next year after being dropped this year!